Lake Wales is located in Central Florida about 40 miles south of Disney World, and less than 15 miles from LEGOLAND Florida, in nearby Winter Haven. The city is home to the historical and beautiful Bok Tower Gardens and is also the location of the weird phenomenon of Spook Hill. If you're visiting nearby attractions and will be making a stop in Lake Wales, you'll find the weather pleasant with an overall average high temperature of 83 degrees Fahrenheit (28 degrees Celsius) and an average low of just 61 degrees Fahrenheit (16 degrees Celsius). If you're packing for a trip to the area, shorts and sandals will keep you comfortable in the summer and nothing more than a sweater or light jacket will usually keep you warm enough in the winter. 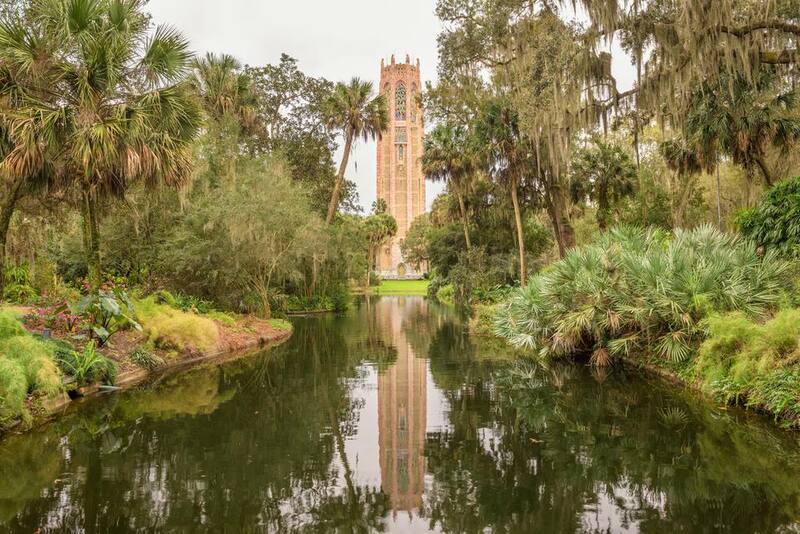 However, if you're visiting Bok Tower Gardens in the winter, you'll want to dress warm and in layers since the shade of the trees and winds can make your visit a chilly one, especially if its late in the afternoon as the sun begins to set. Hurricane season runs from June 1 through November 30. Lake Wales, like most of Florida, has not been affected by a hurricane in recent years. The last storms were in 2004 and 2005. Hurricane Frances affected the area in September 2004 and just three weeks later, the stronger Hurricane Jeanne blew through town. A year later, Hurricane Wilma blew across the state leaving a path of destruction. Another summer weather malady to watch out for in Central Florida is lightning. Considering Florida is known as the Lightning Capital of the U.S., and Orlando is situated in what has often been described as "Lightning Alley," visitors should understand that lightning poses a severe risk. What to pack: Pack warm weather-friendly clothing, like shorts, T-shirts, light dresses, and sandals. Don't forget sunscreen and a wide-brimmed hat to protect you from the sun. Summer temperatures are quite high, typically hovering in the 90s Fahrenheit. Summer is also the wettest season in Lake Wales, with rain falling for nearly half the month in some cases. (July is the wettest month, with rainfall averaging almost eight inches). This is a slower time for tourism due to the high temperatures and the rain, so hotels and other accommodations may be slightly less expensive. What to pack: Bring shorts, tank tops, skirts, and other clothing that will keep you dry and comfortable in the oppressive heat. A lightweight rain jacket is also a good idea, should you get caught outside in a summer thunderstorm. While September is still quite hot, temperatures cool down into October and November. Humidity also drops, and the chance of rainfall decreases to just two or three days per month. This is a slow time for tourism, which means you can find good deals. What to pack: Fall clothing for Lake Wales won't be too different than summer clothing—temperatures are still quite warm for the first part of the season. During the later parts of October and November, add a light jacket or sweatshirt to put on in the evening when temperatures drop further. Cool, but comfortable, winter temperatures make Lake Wales an enjoyable place for travelers seeking great weather. With average highs around 70 degrees Fahrenheit, it's a nice time to be outside. Rain is minimal these months, occurring on just four days each month. This is also the busiest tourist season. What to pack: You won't need heavy winter clothing for Lake Wales, but bring along a jacket for the evenings. During the day, short sleeves are typically fine, with either shorts or jeans.